To ensure students have a global perspective, the GTTP developed an introductory curriculum, PASSPORT TO THE WORLD: An Introduction to Travel & Tourism. It comes with three modules: a module for use by instructors; a module for use by students, which includes a guide to information resources; and a module with a comprehensive schedule of student activities. It is available in English, Chinese, Russian, Hungarian, Portuguese, French and Spanish. Click here to see the Introduction to the Instructor’s Guide which includes the GTTP’s approach to teaching Travel & Tourism, an explanation of the PASSPORT curriculum and an outline of the syllabus. PASSPORT was developed by GTTP country directors and teachers. The course provides students with a basic understanding of tourism as a global industry. The curriculum is “teacher friendly” and is designed in such a way that basic concepts and information are combined with activities that focus the students on their own community or region. In some countries, like Russia, PASSPORT TO THE WORLD, is the officially-approved introductory curriculum. In other member countries, like Hungary and Canada, PASSPORT TO THE WORLD is used to supplement existing curriculum. In other member countries, like Hungary and Canada, PASSPORT TO THE WORLD is used to supplement existing curriculum. In India PASSPORT TO THE WORLD is being introduced to students in secondary school. In the Philippines, PASSPORT TO THE WORLD is used in first year university studies. 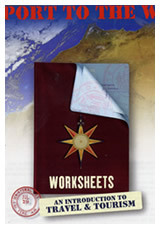 In Kenya PASSPORT TO THE WORLD was approved by the education ministry and is used to introduce students to this subject. For countries that are just starting to offer this subject, PASSPORT TO THE WORLD can be used as the introductory curriculum and provides a basis for understanding the industry and for going on to further study. This follow-on course is designed to give students a broad understanding of the many elements that relate to sustainability in Travel &Tourism destinations, transportation, accommodation, food and entertainment/activities. Click here to see the cover and first pages of the course text. There are activities that teachers can assign to help students further understand the concepts and relate them to their own communities. Linked to this course is an on-line competition, co-sponsored with UNWTO. The 2018 competition will be available through this website in January 2018. The results of the 2017 competition are included here. Students who master the material in PASSPORT TO THE WORLD are eligible to receive the PASSPORT TO THE WORLD CERTIFICATE OF ACHIEVEMENT. To earn this certificate, students must complete a portfolio of work that demonstrates competencies, including knowledge of the subject matter, skills, and a professional work ethic. The Institute of Travel & Tourism (ITT), the UK’s leading travel professional society, and the World Travel & Tourism Council (WTTC) have endorsed this certificate. These endorsements are important for GTTP students.